I had a lot of work with the extration. I have a white-black version without the map, if somebody would like it, tell me (I don't know if I can upload two version of one wallpaper or not) It simple, I know :) I'm working on an other wallpaper, but I need some help to make it. Nice idea to put the characters that way ^^ Really well done. Thats a pretty cool wallie Nona!Nice and creative. I like how you made the crew from one peice black and outlined and the map as the bg .Pretty cool. :D What a great idea. XD I really enjoy shadow and silhouette techniques. ;) The map BG was a good touch, subtle and works well with the shadows. :pacman: Not a fan of One Piece, but I enjoy creative artwork. take care! o wow! i really like this one! :D i like how you can see the world in the background a little! i like it! wah ..it is very cool....i like it very much! it is very interesting..
ah those old maps are excellent! i really like them... and the combination with the outlines of the characters and how you arranged it is really good! wow...this is a really original concept...i really like the map in the background with the sillouetted images! but the map looks a bit pixely. awesome wallie, nona!! it's so creative! This one look so cool !! I love it !! You are so awesome !!! It does show out the character and bring out the meaning of this anime !! Great work and I love it !! Thank for sharing !!! cool colours and everything!! you rule! The idea is really good. I like the globe image in the background. And the black and white outlined characters over lapped with it. Looks really coo. I'm not a fan of One Piece, but the wall looks really good, great work. I waited a couple of days because of download problem. Now that I can download again and look in full size...wow, this is nice. Really creative way of doing a wallpaper. I don't think not that many wallers thought of using character silhouette as part of wallpaper. Using nautical map as part of background is a nice touch. 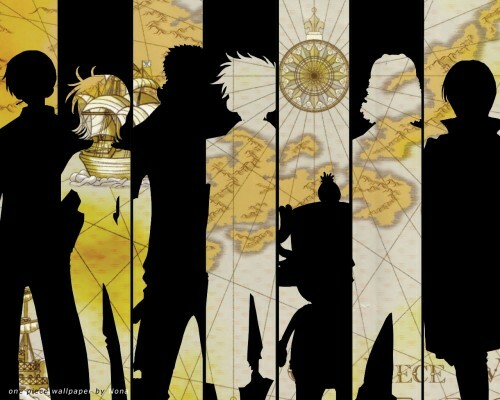 One Piece! I really love it *_* Interesting idea ror a wallie, kinda mysterious^^ I really like it^^ heh.. another great wallie of yours^^ keep it up!